It appears that once again a religious leader is forced to defend his deceiving and ripping off the people that he supposedly "serves." 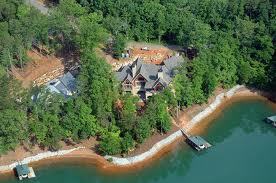 It is alleged that David Cerullo, the CEO of "Inspiration Network," is building himself a $4-million dollar home in a in a gated lakefront community in South Carolina. According to an article I read from Associated Press (Charlotte, N.C.), he is doing this while at the same sending others to the unemployment lines by cutting jobs in his new headquarters. In addition to cutting jobs, the article reported that, "the ministry froze wages and stopped making contributions to government retirement accounts." As someone has said, "perceptions are everything," and if that is true, I think I smell a rat. Now don't get me wrong; if you can afford it, go ahead and build yourself as big a place as you want to. No one is saying that you should not. It's all a part of the "American Dream." However, in the case of "ministry," where people are often duped into donating vast sums of money that they often cannot afford to give, I cannot help wondering if Cerullo is wise in building such an elaborate mansion. In my opinion, the whole thing seems rather unethical and obscene to me. "I tell you the truth, they have received their reward in full"
Enjoy your new mansion, Mr. Cerullo. Don't let the cries of the poor and hungry rob you of your sleep. I'm sure it's all good. They're probably used to living in their cardboard boxes and shanty-town dilapidated shacks by now anyways. I'm sure that someone will feed them tomorrow ... maybe. It appears that the fleecing of the sheep continues. According to the following link, Mr Cerullo has enjoyed a 47% salary increase since 2008 and now earns a whopping $2.5-million per year. Forgive my sarcasm but, how ever does he manage to make ends meet? I wonder what the average wage increase has been during that same period for those who follow him? Hmm, I'm sure it's not even close. I'm sure there are many in the pews supporting him who also wouldn't mind a wage increase like that. Hmm. In a day and age when unemployment soars, when more and more children go to bed hungry at night, when the banks continue to contribute to the homeless crisis through their unscrupulous mortgage attacks on the family home - is this the time for ecclesiastical leaders to further slap the faithful in the face through massive personal salary increases, all the while continuing to encourage the faithful to give still another cup of blood? Sorry if that sounds harsh, but am I missing something here?